We are excited to announce the roll out of a major Showit Sites update this week that includes new features such as contact forms and progress indicators along with a bunch of bug fixes. The easy way to add a contact form would be to click the new "Add Page Layout" button in the bottom left under the pages list. 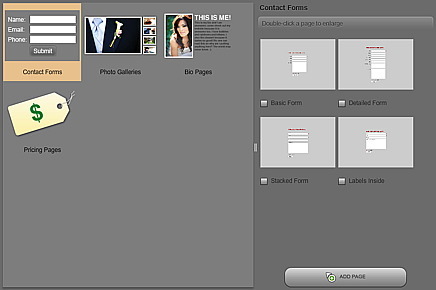 From there, click on contact forms, a layout and then "Add Page". This will have a predesigned form and you can work from there. 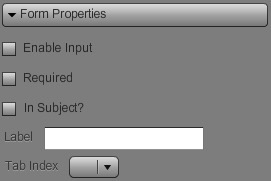 You'll notice the "Advanced" tab for a text field now has a lot more options including a check box for "Enable Input". When this box is checked, a user can then type in that text area on your site. You can make it required and even include text in the text area, include the text in the subject of the email sent to you, and include a label for the text. Once you enable a text field for input, you then need to add a button that will submit the form. You can use any of your normal layer buttons for this that go to another page in your site, probably you'll want a page that says, "Thanks for contacting us" or something like that. Under the previous options for links we added a check box for "Submit Form". Checking this box means that when a user clicks on the button, it will submit the form and then take them to the page you specified. When a user submits a form, an email will be sent to the email address used to login for that site. The second big update includes progress indicators which help a user get feedback on the status of a loading site. Website visitors are used to the way HTML progressively loads content so it can sometimes feel slow when a Flash site is loading content in the background before the site responds and displays it. This is why it is important to indicate that content is being loaded and the progress of the loading. In Showit Sites we provide a "Preload Layer" on each style group that you can put text, images and now Flash preloaders that indicate the exact loading progress. You can find these new Flash components under the "Preloader" tag in the Showit Library. In addition, there are now more options for your initial site load under the site settings including choosing the position of the loader and also the addition of "Flash" as a "Loader Type". You can choose one of the preloaders from the library to be used on the initial load of your site to give your site visitors a better idea of the loading progress. Also, the site information xml is now compressed which turns out to be about 90% smaller than the original xml and dramatically improves the initial site load speed. Finally, for those that have recently experienced issues with uploading, saving, or publishing, we were having some intermittent server issues which have been resolved and dramatically increased the reliability of these server interactions. We hope you enjoy the update and we appreciate your feedback! Hey Todd, great to meet you at Jason's wedding. I love the new update and I would say it brings SIS far ahead of the competition (do you really have any competition?). Keep it coming!